Hi - I have been searching high and low for some time now trying to find detailed specifications for the 7-pin DIN connector and especially information about pins 6 & 7 since pins 1-5 are as I understand it identical to the 5-pin DIN connector - please feel free to correct me if I am wrong. I am in the process of constructing a MIDI device with the intention of being powered and in turn passing power via the 7-pin DIN (female) connectors and need to ensure I have the right specs. 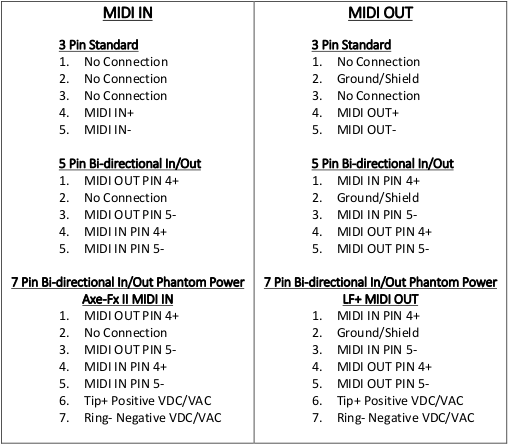 Since there are a number of MIDI devices on the market utilizing 7-pin MIDI DIN connectors, where pins 6 & 7 carry the current (V) I assume a specification exists and would very much appreciate a hint of where I can get a copy. The 7-pin connector was chosen because it is compatible with 5-pin ones, so the first five pins indeed must be the same. There is no official specification for power over MIDI cables. Power could be anything: 9 V, 12 V, or maybe more, and DC or AC. So you probably need a voltage regulator and a bridge rectifier.